Fine art is all about the head, an intellectual engagement – it’s a non-contact sport. Craft, on the other hand, is all body, where touch is central. Art is an experience; craft a relationship, and it means nothing without the utility. Tailoring, carpentry, jewellery, pottery – it’s all the same. The relationship is borne out in the ritual of use within the domestic setting. This domesticity is important to me as a maker of functional ware. The moments when I am at my most glad are when we, as a family, surround the kitchen table on a Saturday or a Sunday lunch or tea-time. There is much noise and laughter, and, when the girls are on form, plentiful singing. 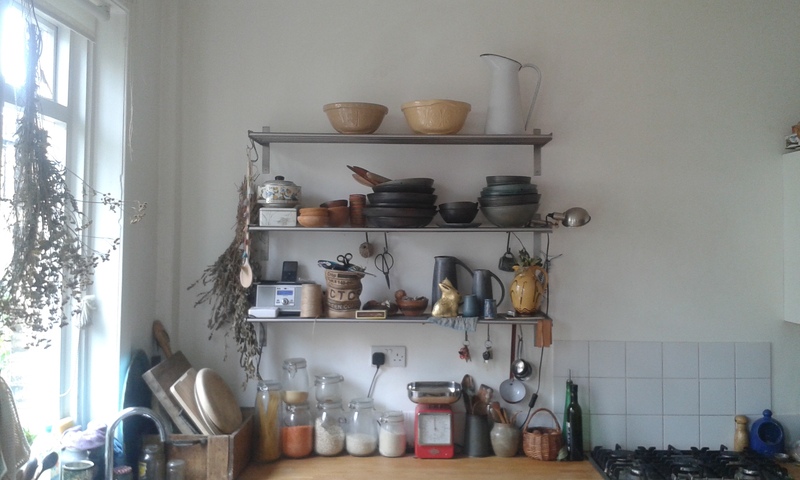 Or quiet days when it is just my partner and I, and our youngest, pottering about the kitchen, doing separate things together – making chutney, drawing, tidying. These are glad times, too; some of our favourite. Since I started making pottery, my pots have increasingly been a part of these occasions. You are currently viewing the archives for April, 2015 at The Hopeful Potter.